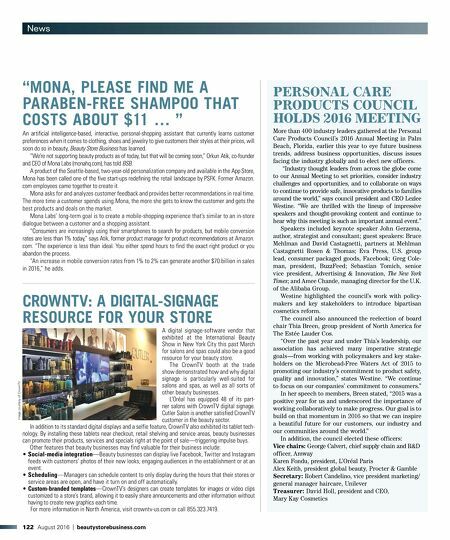 122 August 2016 | beautystorebusiness.com News PERSONAL CARE PRODUCTS COUNCIL HOLDS 2016 MEETING More than 400 industry leaders gathered at the Personal Care Products Council's 2016 Annual Meeting in Palm Beach, Florida, earlier this year to eye future business trends, address business opportunities, discuss issues facing the industry globally and to elect new officers. "Industry thought leaders from across the globe come to our Annual Meeting to set priorities, consider industry challenges and opportunities, and to collaborate on ways to continue to provide safe, innovative products to families around the world," says council president and CEO Lezlee Westine. "We are thrilled with the lineup of impressive speakers and thought-provoking content and continue to hear why this meeting is such an important annual event." Speakers included keynote speaker John Gerzema, author, strategist and consultant; guest speakers: Bruce Mehlman and David Castagnetti, partners at Mehlman Castagnetti Rosen & Thomas; Eva Press, U.S. group lead, consumer packaged goods, Facebook; Greg Cole- man, president, BuzzFeed; Sebastian Tomich, senior vice president, Advertising & Innovation, The New York Times; and Amee Chande, managing director for the U.K. of the Alibaba Group. 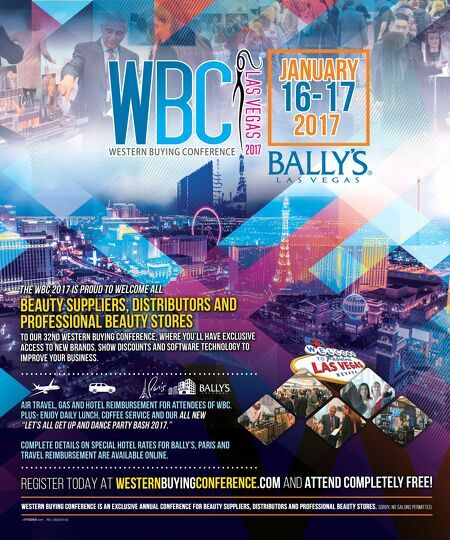 Westine highlighted the council's work with policy- makers and key stakeholders to introduce bipartisan cosmetics reform. The council also announced the reelection of board chair Thia Breen, group president of North America for The Estée Lauder Cos. "Over the past year and under Thia's leadership, our association has achieved many imperative strategic goals—from working with policymakers and key stake- holders on the Microbead-Free Waters Act of 2015 to promoting our industry's commitment to product safety, quality and innovation," states Westine. "We continue to focus on our companies' commitment to consumers." In her speech to members, Breen stated, "2015 was a positive year for us and underscored the importance of working collaboratively to make progress. Our goal is to build on that momentum in 2016 so that we can inspire a beautiful future for our customers, our industry and our communities around the world." In addition, the council elected these officers: Vice chairs: George Calvert, chief supply chain and R&D officer, Amway Karen Fondu, president, L'Oréal Paris Alex Keith, president global beauty, Procter & Gamble Secretary: Robert Candelino, vice president marketing/ general manager haircare, Unilever Treasurer: David Holl, president and CEO, Mary Kay Cosmetics CROWNTV: A DIGITAL-SIGNAGE RESOURCE FOR YOUR STORE A digital signage-software vendor that exhibited at the International Beauty Show in New York City this past March for salons and spas could also be a good resource for your beauty store. The CrownTV booth at the trade show demonstrated how and why digital signage is particularly well-suited for salons and spas, as well as all sorts of other beauty businesses. L'Oréal has equipped 48 of its part- ner salons with CrownTV digital signage. Cutler Salon is another satisfied CrownTV customer in the beauty sector. In addition to its standard digital displays and a selfie feature, CrownTV also exhibited its tablet tech- nology. By installing these tablets near checkout, retail shelving and service areas, beauty businesses can promote their products, services and specials right at the point of sale—triggering impulse buys. Other features that beauty businesses may find valuable for their business include: • Social-media integration—Beauty businesses can display live Facebook, Twitter and Instagram feeds with customers' photos of their new looks, engaging audiences in the establishment or at an event. • Scheduling—Managers can schedule content to only display during the hours that their stores or service areas are open, and have it turn on and off automatically. • Custom-branded templates—CrownTV's designers can create templates for images or video clips customized to a store's brand, allowing it to easily share announcements and other information without having to create new graphics each time. For more information in North America, visit crowntv-us.com or call 855.323.7419. Image courtesy of CrownTV "MONA, PLEASE FIND ME A PARABEN-FREE SHAMPOO THAT COSTS ABOUT $11 … " An artificial intelligence-based, interactive, personal-shopping assistant that currently learns customer preferences when it comes to clothing, shoes and jewelry to give customers their styles at their prices, will soon do so in beauty, Beauty Store Business has learned. "We're not supporting beauty products as of today, but that will be coming soon," Orkun Atik, co-founder and CEO of Mona Labs (monahq.com), has told BSB. A product of the Seattle-based, two-year-old personalization company and available in the App Store, Mona has been called one of the five start-ups redefining the retail landscape by PSFK. Former Amazon. com employees came together to create it. Mona asks for and analyzes customer feedback and provides better recommendations in real time. The more time a customer spends using Mona, the more she gets to know the customer and gets the best products and deals on the market. Mona Labs' long-term goal is to create a mobile-shopping experience that's similar to an in-store dialogue between a customer and a shopping assistant. "Consumers are increasingly using their smartphones to search for products, but mobile conversion rates are less than 1% today," says Atik, former product manager for product recommendations at Amazon. com. "The experience is less than ideal. You either spend hours to find the exact right product or you abandon the process. "An increase in mobile conversion rates from 1% to 2% can generate another $70 billion in sales in 2016," he adds.